Show notes: On today's show, let's talk about summer beers. Right now I'm drinking Shoals Pale Ale from Smuttynose. Okay it's not a Long Island beer, but I picked this up at Big Z's in Huntington along with some other summer beers. My idea of a summer beer is one that is thirst quenching, light on the alcohol, and has a dry finish (tartness is a bonus). Speaking of summer beers, I brewed a hefeweizen last Sunday. It's fermenting away right now. I brewed this beer from extract (a prepared malt syrup) instead of starting with malted barley and wheat. If you listen to the show, I explain how I did the brew and how I'm keeping the beer cool while it ferments. On July 5th Southampton Triple will be available at beer stores and on tap at your finest Long Island pubs. 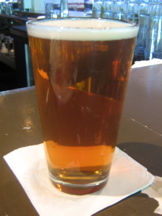 A Triple is a Belgian Abbey style ale that is higher in alcohol and light colored. If you've ever had the Chimay Cinq Cent or Westmalle Triple, then you'll have an idea what to expect. When the beer is available, I'll get a bottle and critique it on the show. Also on the Calendar, DEKS in Rocky Point is hosting another Beer Dinner. This one will be on July 11th at 7 pm, so mark your calendars. The cost is $30 and you must reserve you spot before 5 pm on July 9th. 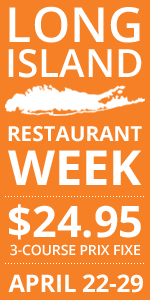 You can reserve in person or give them a call at 631-821-0066. I have a food menu and Mike and I are still working on the beer pairings. Just to remind you, if you love beer and/or whiskey, you'll want to join the Long Island Malt Enthusiast mailing list. I'll keep you alerted of all the news on Long Island beer and whiskey news. Sometimes I get completely and utterly sick of tasting merlot. It's the most-planted grape on Long Island and every winery makes at least one varietal bottling--and often more than that. Hell, Wolffer Estate makes four 'levels' of merlot. And, despite growing conditions that are excellently suited to the grape, there is a lot of bad merlot being produced. It's sad really, because when grown in the right way and treated the right way in the winery, merlot leads to this regions most consistently delicious wines...even if the best ones will cost you at least $30 and up to $125. 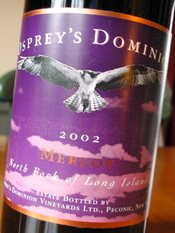 Osprey's Dominion Vineyards 2002 Merlot stood out from a dozen local bottles during a recent tasting--both for it's quality and its relative value. It offers classic black plum aromas that mingle with blackberry preserves, sweet cedar, smoke and vanilla. At first the nose seems a little on the fruity side, but the palate shows impeccable balance with rich chocolate, dark fruit flavors accented by tobacco and a clean minty note towards the finish. The medium tannins provide nice, but not overly aggressive, grip and structure. Give it another year or two in bottled and this $20 wine is really going to round out, I think and be even better. I've written fairly regularly about the sad state of New York winery websites, so I was excited this morning to discover that Channing Daughters Winery, one of my favorite Long Island producers, has a new website. With their focus on all things artisanal, it's nice to see the new site that more accurately reflects the beauty of their operation. The design is clean, visually appealing and the navigation reasonably simple. I also like the subtle, effective use of flash throughout the site. It's well done and not overdone. The banner on the site, while beautiful, is way too large. Even on my high-resolution monitor, it takes more than 50% of the browser window, leaving less than 50% for the actual site content. This could have been fixed easily by reorganizing the navigation so that it wasn't four deep and adding secondary navigation (which is used in places on the site anyway). The usability, as it relates to page length, is ludicrous on a few pages as well. Check out the "Our Wines" page and you'll see what I mean. That is one long page. Wouldn't it have been almost as easy to at least do one page for each of the main categories: Whites, Pinks and Reds? This was a big problem on the old site as well. It would also improve the usability if they "Home" link were put on the CDW logo in the upper left. That's pretty much a standard these days. Burying "Home" in the lower right navigation isn't great. Looking at the code, I don't see any meta keywords on any of the pages and the few pages that do have meta descriptions, they are all the same one that seems to go with the events page. That's not going to help search engines much, is it? Despite these issues, the new site is definitely a move in the right direction. And that's the most important thing for wineries to remember--as long as you're getting better, it's better than standing still. Still, these are pretty basic things that would have been easy to fix. My guess? The agency that built the site, which does great design work and designs some great wine labels, just doesn't have the Web experience it should for projects like this. Far too many agencies are building sites without basic understanding of the technology and user experience. Have you heard about the Niagara Escarpment wine region in Western New York? I have, but I'll admit to not knowing a whole lot about it or its wines. 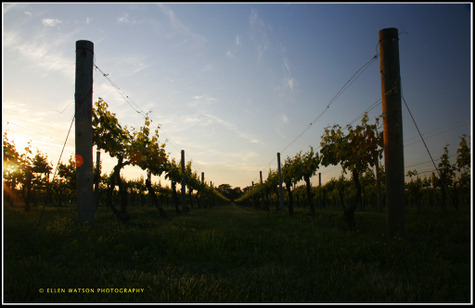 Very few of the wines make it to Long Island and, so far, very few wineries that I've dealt with have much interest in publicizing their wines in this part of the state. But, that might be changing. Duncan Ross, of not-yet-opened Arrowhead Springs Winery, and I just did an interview together that will be published over at Appellation America soon--and I learned a ton about the region. It's really an incredible geological phenomenon. But more on that when the story is published. In the meantime, I wanted to tell you about a new blog, NiagaraEscarpment.net, run by Bryan Calandrelli. You know Bryan already if you read many wine blogs. He's the founder of Water Into Wino. He's also a a fellow cabernet franc lover. He's recently moved up that way (and has even planted a couple grape vines with plans for more in the future) and he has already proven to be the online resource for the wine and wine country. 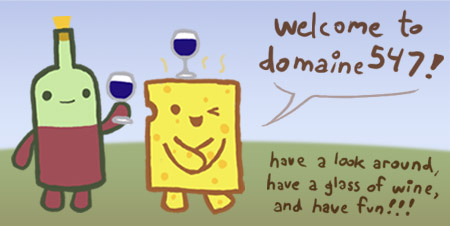 I'd like to welcome domain547 as LENNDEVOURS' newest sponsor. domain547 is a site that I enjoyed long before they floated the idea sponsoring LENNDEVOURS, so I was thrilled when they approached me. The site combines a blog, a forum and a wine shop...all with a fun, irreverent attitude that is hard not to love. This might surprise you, but every now and then, I like to take a week off from drinking wine (or alcohol of any sort for that matter)--and this is one such week. Sure, I've got a lot of wines in my tasting queue, but they can wait until the weekend. For now, I'm going to enjoy a week filled with lots of water, which will refresh my body, mind and also palate. But don't worry, I've got plenty of tasting notes I haven't published yet and a few more interesting things planned. I like lime wedge or even a cucumber slice in my water...do you have any favorite ways to 'brighten' a plain glass of water? I'm back this week with more reportage on the Long Island beer scene. For the whole story, you'll have to listen to the podcast (links below), but I'll give you a quick overview of what to expect. On today's show, I take a trip to out to Big Z Beverage in Huntington (1675 East Jericho Tpk., 631-499-3479) and talk to the new owner, Mark Tuchman. He took over the business a little over two months ago and he's been reshaping his beer store into a craft beer destination. In the Long Island Beer Round-up, I give you a quick report on a visit to Canterbury Ales. I had a couple of Southampton beers on tap that night, and the Hanami Ale from Smuttynose. The tap system at Painter's is back up and running and pouring three different Blue Point ales, but the only tap pouring fresh beer was the Blueberry Ale, both the Summer Ale and Toasted Lager were past their prime. Also on the Calendar, DEKS in Rocky Point is hosting another Beer Dinner. This one will be on July 11th at 7 pm, so mark your calendars. I have a food menu and Mike and I are working on the beer pairings. I'll let you know next week what we came up with. Also, DEKS has a new beer on tap; it's the Sixpoint Brownstone. It's very fresh and delicious right now, so go soon. I'll be there later today to have a pint or two. I'll tell you about the B.E.E.R. 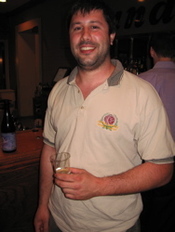 (Suffolk County's homebrew clue) meeting and about Scott Vaccaro from Captain Lawrence Brewing Company in Pleasantville, New York. Scott talked to the club for about twenty minutes and then served up six excellent bottled beers. I play a four minute clip where Scott talks about his brewery and his beers. Captain Lawrence is not yet distributing its beers to Suffolk County, but I have had a few of Scott's beers on cask at Bobbique in Patchogue. I wrap up the show with a trip out to our CSA, a good place to get locally grown and organic ingredients for your brewing. Ellen Watson, our resident photographer, got up before dawn this morning to take this picture at Wolffer Estate. 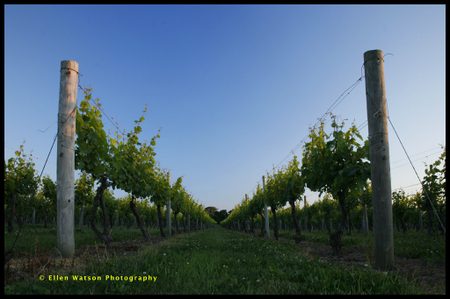 This picture was taken on June 21 at around 5:30 a.m. and it has been added to my Flickr slideshow that is showing this same spot in the vineyard during the growing season. Waters Crest Winery isn't new to me or to you guys. I've written about Jim Waters and his wines many times in the three-plus years I've had this blog. But, for those of you that are new to LENNDEVOURS, Waters Crest Winery is one of Long Island's smallest producers and one that I've long loved mainly for its white wines. 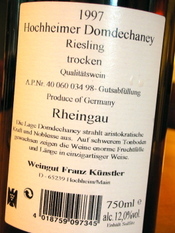 The riesling in particular is a favorite of mine. 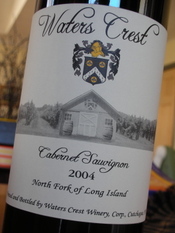 Being a small winery is one thing, but with his Waters Crest Winery 2004 Cabernet Sauvignon ($55) winemaker and co-owner Jim Waters has taken "small batch" wine to a new level. With only 24 cases made, it is available only to the wine club, but I was able to get my hands on a bottle. Bold and full bodied, blackberries, blueberry jam, vanilla and a faint eucalyptus notes combine in a ripe, expressive nose. There is deep extraction here and substantial tannins, but even in its youth the dark fruit and vanilla flavors hint to a great future. The aging potential is big here. People often make generalizations about Long Island cabernet sauvignon, calling it green and un-ripe. And, while there's some truth to that, there are exceptions. This is one of them. So a few people have complained about the last few themes for Wine Blogging Wednesday. First you moaned about having to drink box wines. Then you said that wines from the Midi were too hard to find. And finally, you complained about the prices on Washington State cabernet sauvignon. Well guys, the July theme is for you. The wines for WBW #35: Passionate Spain are easy to find, you can pick a white or red wine, and Michelle, our host, wants us to spend $10 or less. Easy right? So, join us on July 11 for WBW #35. What Wine Rating System Do You Want Me to Use? Wine ratings. They have long been a source of tension, discussion and angst in the wine world. And with Blake Gray’s recent piece in the San Francisco Chronicle last week about the 100-point scale, it's hot on the blogs once again. It's also something that I've wrestled with here on LENNDEVOURS for quite a while. Long-time readers will remember that I used to offer grades...A through F. Then, I decided that I didn't like that system and wasn't sure what to move to. So, I moved away form rating/grades altogether. After all, I try to write reviews--you know, actual words--that tell you far more than any number or grade could. But now Tim over at Winecast has proposed a wine blog-wide standard rating system...a 5-star system. I'd actually been considering the 5-star system for a while now anyway. Several wine community sites use similar systems, it seems fair, and it is easy to understand. There's a reason that so many non-wine industries use the system, after all. And now Tim brings up several other good reasons for it. Here at LENNDEVOURS, my goal is always to provide you, my readers, with the information you want. It's not about me...it's about you. So, with that in mind, we're going to be democratic. You can either leave a comment below, or email me directly. Voting will remain open for a week or so. Yes, chardonnay is the white wine that dominates the Long Island wine scene. It's the most planted and, obviously, most made. That's because despite trends away from it, it's still the most sold white wine in the market. Yes, I like--and sometimes love--local chardonnay. The acid balance can be stellar in these parts. But, so far this spring, the wines I've been digging most have been local sauvignon blancs. 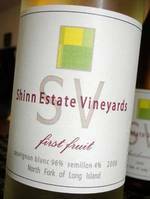 There have already been several 2006 sauvignons that I've enjoyed and Shinn Estate Vineyards’ 2006 First Fruit ($23) which is primarily sauvignon blanc, with just a squirt (4%) Semillon, fits right in. Right out of the bottle, the nose is a little taut and doesn’t offer much, but with a little coaxing, bright, fresh aromas of juicy pear citrus and sweet basil emerge. Medium bodied and flavorful, the pear flavors are lip-smackingly delicious, with subtle ruby red grapefruit and terrific acidity. The herbal character of the grape is here, particularly on a surprisingly long minty-lime finish, but it’s not aggressive or overbearing. Impeccable balance is on display here. Local seafood prays for this wine when it goes to sleep at night. As someone with wine blog that is focused on a particular region, I always love when I discover others. The newest, Washington State Wine Blog focuses on, surprise surprise, Washington State wines. It's still very new (like less than a month old new) but it certainly is worth a visit, so check it out. 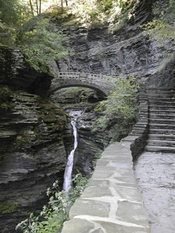 In the first part of this series, I wrote about when to go to the Finger Lakes, where to stay for maximum wine-tasting opportunity, and how to go about selecting wineries to visit. This time around, I'd like to talk about the general qualities of the wine and other attractions. If any readers have any questions--any questions at all--feel free to leave a comment. I am happy to help no matter the query! The Finger Lakes region has a reputation for white wine, which is well-deserved. Riesling is good at most wineries, although some do make it a little too sweet. A nice dry Finger Lakes riesling is really a treat! Chardonnay, when ripe enough, exhibits the subtle floral flavors that are absent in a lot of the strong warm-weather West Coast offerings. Gewürztraminer does fairly well in the Finger Lakes, and pinot gris and Sauvignon Blanc are offered at some wineries and are more often than not successful. Most vinifera whites can thrive in the cool growing climate of the Finger Lakes and when done well will remind tasters more of the European style of winemaking than many of the New World growing regions. 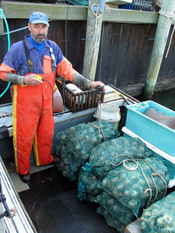 Reds require a little more caution, but there are some real finds for the discriminating consumer. The cool climate provides a challenge, but experienced winemakers can find ways to promote the positive qualities that can be attained. A good pinot noir from the Finger Lakes has a musty, mushroom-like nose and a delicate cherry or raspberry taste that can really linger. Cabernet franc seems to ripen well for most producers, and a bottle that has been left to age for a year or two seems to really strike a balance of herbal overtones mixed with a bit of fruit. A master winemaker can create a good meritage by blending select grapes, but beware straight bottlings of cabernet sauvignon or merlot. These single varietals thrive only in excellent years and there are some wineries that import grapes to help boost their appeal. Many of the most reputable wineries avoid these varietals or release them only when a hot summer produced a crop that was good enough to use after meritages were mixed. Keep an open mind on the reds, but don't be surprised if some disappoint. Lenn is still trying to find a Finger Lakes red that he likes! 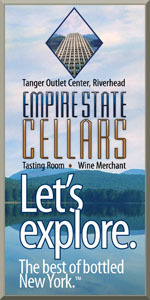 The Long Island Merlot Alliance has sponsored a summer intern to do local Merlot research during the 2007 vintage. The intern, Christopher Grassotti, is a student in the Masters degree program in viticulture and enology at Ecole Nationale Supérieur Agronomique in Montpellier, France. In his work for LIMA, he will be working closely with LIMA members, Viticultural Research Program Leader Alice Wise, and others at Cornell University. He will focus on defining the dominant and strongly identifiable aroma/ profile of Long Island merlot and identifying the differences found in other quality wine regions. This will allow specific analysis, in the future, of these identified components. Aroma and tasting workshops are being held weekly over the summer to help achieve these goals. “I am interested in helping better refine our understanding of those elements of climate, soil and vineyard management that help produce the wine grapes with the highest winemaking potential, especially taking into account the particular conditions found here on Long Island,” states Grassotti. Mr. Grassotti is also working on vineyard research with regard to leaf removal techniques on merlot. The research will focus on timing and severity of leaf removal and how both relate to wine quality. The experiment is being done in conjunction with a project led by new Cornell University Viticulturist Dr. Justine Vanden Heuvel. It is the first experiment in 20 years on Long Island that directly involves Cornell viticulture faculty. I just heard about all of this this morning, but I'll be speaking to Mr. Grassotti soon I hope. Stay tuned for more information. I'm just glad to see LIMA being publicly active again--haven't heard much from them lately. 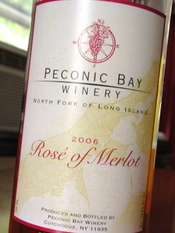 In the past, I've had some less-than-nice things to say about Peconic Bay Winery. It wasn't that I didn't enjoy some of their wines--I absolutely do and have for quite a while. Their Stainless Steel Chardonnay and Riesling are both great every day wines at fair prices. But man, they made some sweet, koolaid-esque rose in the past. And, in their tasting room, flights started off with those wines, which I thought probably turned off the serious wine drinkers before they got down to the better wines. I knew that it did me. I'm sure that it's purely a coincidence (it's not like I'm Robert Parker or or something) but with the 2006 vintage, they've started to produce a dry rose that is a welcome start to any tasting flight. According to the back label, it's with merlot grapes with some steel-fermented chardonnay, and the result is fresh and thirst quenching. On the nose there's a lot of citrus--grapefruit and lime--with hints of watermelon and watermelon. It's lively on the palate and tastes like a fresh watermelon slice sprinkled with fresh lime juice...without the sweetness of fresh watermelon. Nicely balanced acidity leaves it clean on the finish. It's probably best suited to sipping on it's own, but I could see enjoying this with any summer lunch--salads, sandwiches, seafood. While not as nuanced as some of the other local 2006 roses on the market, it's still a good, satisfying rose for $14. And at the end of the day, isn't that what rose is supposed to be, satisfying? Tonight, Ellen Watson, our resident photographer, sent me the latest shot in our series at Wolffer Estate. This picture was taken on June 10 at around 8:25 p.m. and it has been added to the Flickr slideshow. It's Wednesday and I'm drinking wine virtually chosen by another person, so it must be Wine Blogging Wednesday, this time hosted by Catie from the Through the Walla Walla Grape Vine blog. The theme, fittingly enough, is cabernet sauvignon from Washington State, with Catie offering up extra kudos for anyone tasting a Walla Walla wine. Unfortunately, there won't be any brownie points coming my way. Try as I might, I wasn't able to find a varietal cabernet sauvignon from Walla Walla. 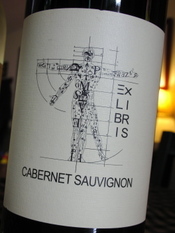 So, I went with this Ex Libris 2005 Cabernet Sauvignon from Columbia Valley ($20). Ex Libris means "from the library" in Latin and Polaner Selections purchased wine lots from 'top producers' to create this wine. It is made with cabernet sauvignon (82%) from the Champoux and Millbrandt Vineyards along with other Columbia Valley cabernet vineyards, blended with merlot (8%), syrah (8%) and a little petite verdot (2%). I opened this wine this evening just as Nena was getting Jackson ready for his last bottle before bed. I tasted it right away and it was okay--dark berries and plum, sweet oak and a little vanilla, but nothing spectacular or interesting. But, we let it sit in our glasses as we took care of the little man and came back to it. It's really opening up nicely. It is still lacking in structure a little bit more me, but it's not the 'fruit bomb' that I feared it was. Hints of tobacco, spice and even a little eucalyptus have emerged on a rather plush palate that, again, could use a little more structure for me. But, if you like your cab fruity and low-tannin, this is a pretty tasty wine. For me, it's just a little too jammy-sweet, although the complexity that has started to emerge is very nice at this price point. Thanks, Catie, for hosting and keep an eye out for the announcement of Wine Blogging Wednesday #35. Contrary to popular belief we in the LENNDEVOURS house do drink wines that aren't from New York State...including quite a few German rieslings, which are among our favorites. Of course, sometimes I just don't feel like pulling out my tasting notebook and taking actualy notes, like with this bottle from Weingut Kunstler, which we enjoyed with a dinner of good bread, cheeses and cured meats. I was going to save this wine for an upcoming WBW (there's a hint for you) but it was a recent gift and he told us it was tasting well right now. Usually, you expect German riesling to be very light bodied and delicate, but this one is anything but. That's not to say that it's heavy, but there is definitely a boldness and body that is unique. 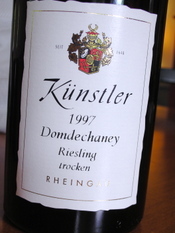 It's dry (which is what trocken means) and, despite it's relative age, still incredibly balanced and fresh tasting. The nose is minerally and floral and the palate is mouthwatering with delicious candied orange zest, orange blossoms, honey and a little petrol. This is actually one of the few rieslings I've had with 10 years of bottle age...and it makes me want to hold onto several of the bottles I have in my cellar. Will they age as well? Hard to say, but that's part of the fun, right? Note: I dug the bottle out of the recycling bin and took this picture of the back.